This basic approach begins with the initial walkthrough, or what some groups refer to as the site survey. This is a basic look at the property in question, usually by one or a couple of investigators. The initial walkthrough may only be a phone interview or even a series of emails and the actual walkthrough may take place just prior to the actual investigation. With the initial walkthrough some groups may look for logical explanations. There may also be a minimal interview done which focuses on the areas of activity. Again, while some groups may go in-depth with some or other aspects of what is covered here the average groups sticks fairly close to this guideline. The second part is the actual investigation. Based on the information the client has given the group will set up their equipment in areas that have events attached to them. Most groups then will conduct vigils of some sort (EVP sessions, Ovilus sessions, flashlight sessions, "controlled" object interactions, etc.) that attempt to have some sort of "interaction" with the purported ghost. The team will utilize various tools and technology to attempt to back up their subjective experiences or to capture evidence that is not seen at the time of the investigation. After the investigation the group will then go through their evidence and search for signs of anything unexplainable that will help verify that the location is haunted. The group will then let the client know what happened during their investigation and hopefully give a direction for the client. While this three-pronged process is used by a majority of groups it is inherently flawed in many ways. Attempting to correlate personal experiences with those of the client does not justify one experience or the other. Many groups seem to be merely grasping at straws when conducting an investigation. If they hear anything, see anything, or interpret anything as unexplainable it instantly becomes associated with the ghost. The mere act of attempting to "validate" the client's events through immersing themselves in the environment in dark conditions is a scientific face palm. Yes, some groups do attempt to "debunk" claims or approach cases from the standpoint of looking to disprove, but many of them still jump to conclusions or do not problem solve enough or document their investigation enough to provide any sort of validation. The real issue is that many groups think they are doing science when they are merely assuming or jumping to conclusions. Many groups do create new technology that intends to help, but science is a process not a tool. While we will cover tools on the next page it should be understood that tools have clouded the judgment of those who wield them as their investment in the tools typically creates an investment that they provide them with evidence. In late 2011 I began to sift through many cases I had conducted since 1996. I had noticed that my group had evolved to hold a very similar style of investigation much like I described above. I knew there was a better way to do things and I knew I had slipped away from a few good habits. I began to read various skeptical viewpoints which offered me a lot of how paranormal groups were doing things wrong, but they offered little in the way to doing them right. With the foundation of skepticism I built layers of psychology, parapsychology, and other methods that would help create a scientific process that could be replicated by other groups. By the spring of 2012 the "E4" Method was born. On the surface this may look similar to the three-pronged approach, but the difference is in the details of this unique approach. The "E4" Method breaks the traditional culture of self immersion and offers the ability to induce controls and placing the client into the investigation instead of being an observer. While this method is a break from the current culture it is just an example of how there is more than one way to investigate client-based claims. The "E4" Method is based on scientific methods yet, understanding the elusiveness factor, I built in belief and other aspects that will help add fuel to the potential anomalous activity without losing the structure of the methodology. I evaluated the types of cases, types of clients, types of outcomes, and many other factors that I wanted to be sure this methodology would allow to work within its structure. "E4" stands for Eliminate, Establish, Enlist, Engage as these concepts make up the basis for the methodology. Eliminate - The use of a primarily subjective investigation procedure needs to be adjusted. 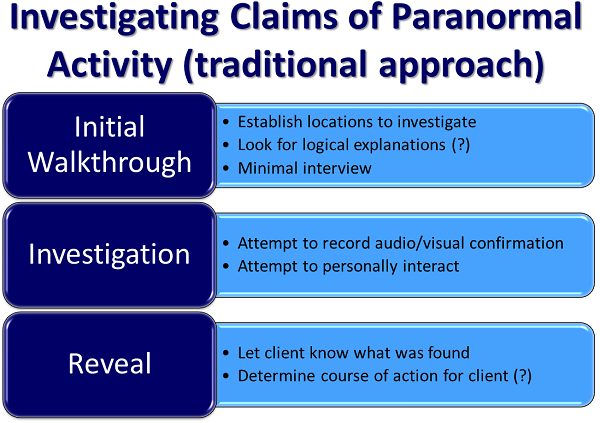 The "E4" Method uses various degrees of participant observation which allows a majority of the investigation team to focus on the environment and not their tools or for subjective experiences. Establish - The use of controls is talked about, but generally groups are open to any type of activity or "demand" specific activity which may not have any relevance to the client. With the "E4" Method the activity is specific to the client and specific to the particular Active Context Exercise that is being conducted. Instead of looking for general events to occur we are attempting to create the same conditions in which the original activity occurred and therefore creating controlled conditions for them to take place. The tools and technology are also not used to detect ghosts, but to monitor for the environmental factors in which they were designed for and digital recorders and other monitoring devices are used as controls and for documenting the investigation not as the main part of the investigation. Enlist - The client should be the center piece to any investigation, not the investigation team. The client needs empowerment and the ability to understand, cope, and eventually move on from what is happening. By making them part of the process we are providing them with the outlet for all of this while under the direction and observation of the investigation team. Engage - The last piece is not engaging ghosts, but engaging the environment. Most teams focus on the "ghost" or merely looking for logical explanations. The "E4" Method focuses on finding the trigger to the events with using controls and the environment. With finding a trigger it may be possible to create repeatable spontaneous activity that other groups or individuals can then replicate and potentially open the door for further interpretation and understanding. The "E4" Method begins with a thorough interview process. This process includes allowing the client to learn how to become descriptive through a technique I call the "five minute day" exercise. I allow the client to talk about their day asking them to go on for five minutes. Most people will go two minutes thinking it has been five. During this process I will typically stop the client and ask them to go back and be more descriptive about how they do specific tasks. Within this questioning I am not only priming the client to become more descriptive but I am learning about how they use their body language and am forming a baseline for their descriptive wording. The next step is to use the cognitive interview method to interview each individual separately about each event. The cognitive interview is a four step process that helps extract more detail from the client. Obviously the interview session will be conducted in quiet and controlled conditions. This is a separate step from any investigation and the attention is completely on the clients during this time. The next phase would be a physical investigation. This is not an investigation for ghosts or any paranormal phenomenon it is a careful reconstruction and examination for logical solutions of any kind. Physical events are reviewed independently and logical solutions are sought through repetition under conditions close to the original as well as using various controls and variables. The clients are interviewed for medical, mental, or other possible explanations that could help explain some, most, or all of the events. The third phase are the Active Context Exercises. At this point we have ruled out a majority of logical solutions, but within the Active Context Exercises we will still have the ability to spot them. We have created a floor plan, have a list of events, and have created specific scenarios designed around specific clients. In the Local Active Context Exercise the client will replay their part of the event in which something anomalous purportedly occurred. This is beyond a mere reenactment as the client will be immersed mentally, physically, and emotionally. Variables will be introduced by the Spokesperson (a single investigator who is the only one who will have contact with the client), documenters will film and record what is happening from a distance and not interact. There is also the Historical Active Context Exercises which is based on the Ghost Excavation methodology used by John G. Sabol, Jr. With the Historical Active Context Exercises we are conducting systematic historical scenarios based on specific people in specific time frames using specific cultural references that the individual could identify with and that others would more than likely not. Consider a home where a little girl ghost is present. In the home suppose one girl did die there, however, three other girls lived there in other time frames. Instead of assuming the girl haunting the location is the one that died, do we not owe it to the client (and our work) to evaluate the possibility of another girl being the source? By using the H.A.C.E. to connect with potential memories, imprinted activity, or intelligent/communicative apparitions in conjunction with the L.A.C.E. we are looking to find a trigger. If we are able to find this trigger we may have the ability to create a repeatable situation of spontaneous activity. Again, this is just one way to look at things differently and to utilize the process of science within a client-based investigation. I have kept the information on the "E4" Method brief on this site. For a little more detail and to purchase a book detailing it even further, visit the "E4" Method home page. 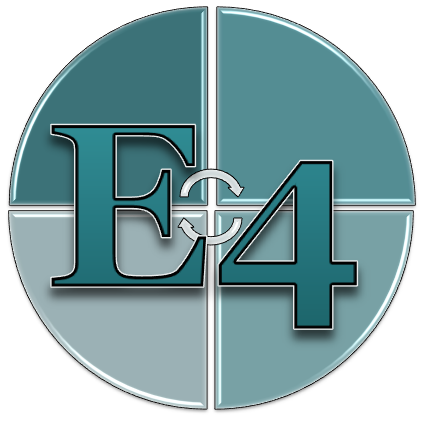 The "E4" Method will soon debut at the Thomas Francis University as a standalone course. The last section on the researcher / investigator site deals with the tools that are the most popular in paranormal investigation. Many people feel there is no "right" or "wrong" way to investigate paranormal claims for various reasons. 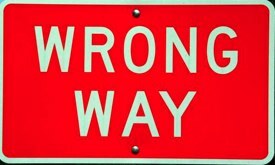 Using purely subjective methods, jumping to conclusions, not looking clearly for logical explanations for events or evidence, and using technology in place of solid methodology is really the wrong way to investigate. Using documentation in everything you do, using controls, applying variables, having others confirm or deny your work are ways of doing things right. Most ghost groups agree that the haunting (residual haunting, true haunting, etc.) or residual energy is the most common type of ghost. So why do the same groups approach every case as if they are attempting to contact an intelligent and communicative apparition? 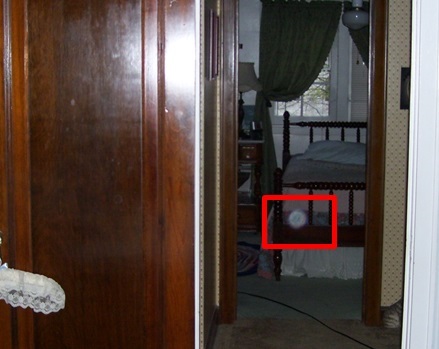 Many groups and individuals still post photographic orb pictures as evidence as ghosts despite numerous others disproving this over and over for well over a decade. Some still hold on to hope by stating that "99% of photographic orbs are dust and bugs, but there is 1% that is unexplainable!" However, there has never been any validation of any photograph that states that it was definitely a spirit orb without any explanation. Even beyond this, if you have a 99% chance of not obtaining something wouldn't the odds be against you? While there have been documented spirit orbs that are self-illuminating, again never verified, these differ completely than photographic anomalies that are illuminated by the flash. The "E4" Method was created in 2012 by Brian D. Parsons based on a skeptical foundation built with walls of parapsychology, psychical research, psychology, body language, and thorough interviewing methods resting under a roof of controls, variables, and varying participant observation. The goal of the "E4" Method is to eliminate the subjective investigation methodology by establishing specific controls during specific exercises utilizing the client while engaging the environment to create repeatable spontaneous anomalous events. 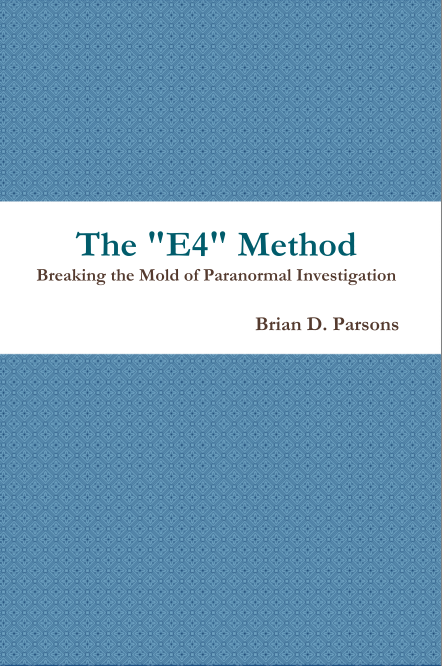 The "E4" Method: Breaking the Mold of Paranormal Investigation, released in 2013, is available by clicking the book above or at Amazon.com or other online retailers. 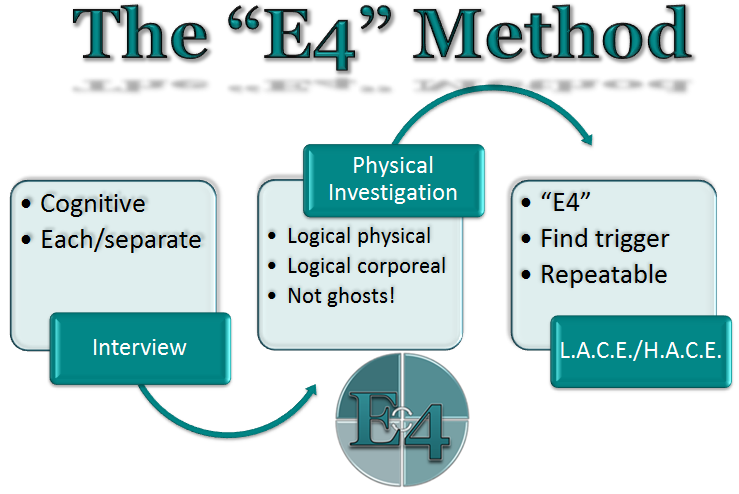 The "E4" Method is a blend of traditional and non-traditional approaches toward client-centered paranormal investigation from Parapsychology, interviewing specialists, as well as the "Ghost Excavation" methodology created by John G Sabol, Jr. and is balanced by advice from professional skeptics. This blend of old and new methodology is intended to provide structure for groups who desire a new direction away from the limited concepts displayed in current ghost investigation culture. 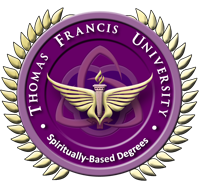 The "E4" Method will soon debut as a standalone course at the Thomas Francis University.